This tutorial shows how to implement a simple Bluetooth service in Qt Extended. A Bluetooth service allows others to connect to your device via Bluetooth and perform some operation. 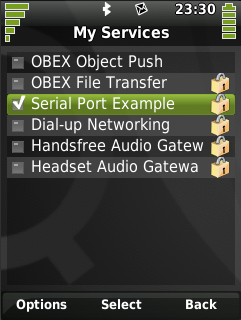 For example, a Bluetooth OBEX Object Push service allows others to connect to your device and transfer files. Qt Extended Bluetooth services can be controlled from the Bluetooth settings application. The Bluetooth services are managed internally by the Bluetooth Service Manager. For more information about the system architecture for Bluetooth services, see Bluetooth Service Management Framework. QBluetoothAbstractService provides a convenient way to implement Bluetooth services within Qt Extended. To create a Bluetooth service, just subclass QBluetoothAbstractService, and your service will automatically be registered as a Bluetooth service within Qt Extended. This means the service will be accessible to external parties through QBluetoothServiceController. It will also be shown in the list of local services in the Bluetooth settings application, allowing end users to modify the service's settings. Naturally, it is possible to implement Bluetooth services outside of Qt Extended by using the BlueZ libraries and standard Linux tools. However, such services cannot be accessed by end users through Qt Extended, and cannot be controlled programmatically through the Qt Extended libraries. This example creates a Bluetooth Serial Port service that listens for RFCOMM client connections and sends a "hello, world" message to a client before disconnecting. When creating a Bluetooth service, you must register a SDP record so that other devices can find your service during a SDP query. You can use QBluetoothSdpRecord to either assemble a SDP record yourself, or load one from a XML file. Remove the 0x0000 <attribute> element (that is, the first <attribute> in the record) and its nested <uint32> element. This is the service record handle, which must not be provided by the programmer as it is automatically generated by the SDP server. Notice this value is not present in the SerialPortSDPRecord.xml extract above. Ensure the RFCOMM channel value (if this is a RFCOMM-based service) is set to a channel that will not be used by any other RFCOMM services. In the above output, the RFCOMM channel is set to 0x01 (the <uint8> value following the 0x0003 <uuid> value). The start(), stop() and setSecurityOptions() methods are pure virtual in QBluetoothAbstractService and so must be implemented. The m_sdpRecordHandle member variable holds the SDP record handle for this service. This handle should be retained when the SDP record is registered so it can be used later to unregister the record if necessary. The example uses QBluetoothRfcommServer is used to implement the RFCOMM server functionality. The first argument to the base class constructor ("SerialPortExampleService" in this example) is the name of the service. This name must be unique among Qt Extended Bluetooth services, as it is used internally to identify the service. // Read the SDP record that we want to register for this service. // returns the service record handle for the newly registered service. // SDP record using QBluetoothAbstractService::unregisterRecord(). Notice that started() must be emitted regardless of whether the service was started successfully or not. The user has tried to start the service from within the Bluetooth settings application. The service has been created for the first time. The service was still running at the time of the last Qt Extended shutdown, in which case start() will automatically be invoked when the service is next created. This method is also invoked automatically by the Bluetooth Service Manager when the security options should be changed. The Bluetooth Service Manager stores service settings in Bluetooth.conf. This stores the security options for known services and defines whether a service should be automatically started the next time it is created. A default configuration file is provided at etc/default/Trolltech/BluetoothServices.conf.